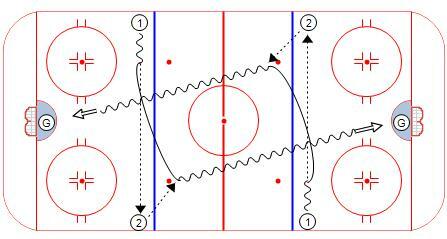 Here’s a Fantastic Hockey Warm-up Drill with a Five-Phase Progression! 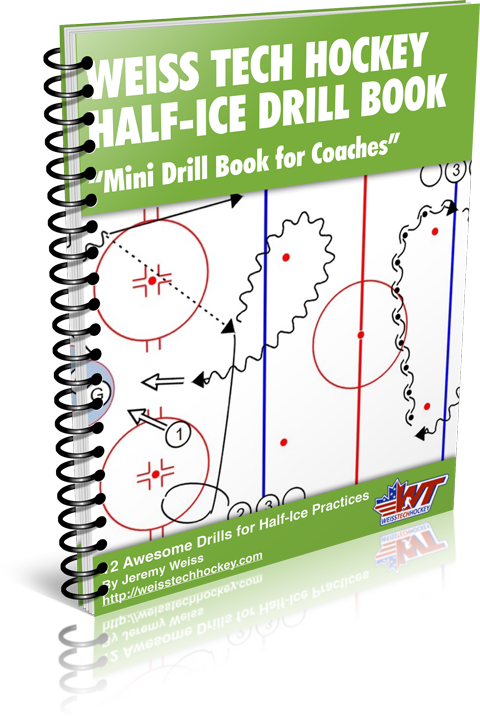 On the whistle, (1) skates across the blueline and makes a pass to (2). Return pass to (1) for a shot on the (G). Stretch Pass : see Seq. # 2. On the whistle, (1) skates across the blueline and makes a pass to (2). Return pass to (1). 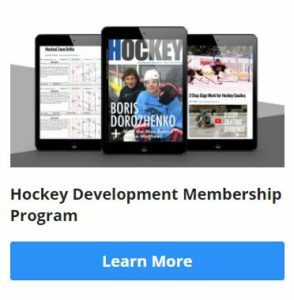 (1) makes a pass to (3) and continues to the blueline. 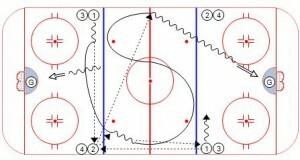 (3) makes a stretch pass to (1) on the opposite blueline for a shot on the (G). Full-circle Stretch Pass : see Seq. # 3. 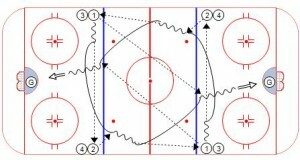 On the whistle, (1) skates across the blueline and makes a pass to (2). Return pass to (1). 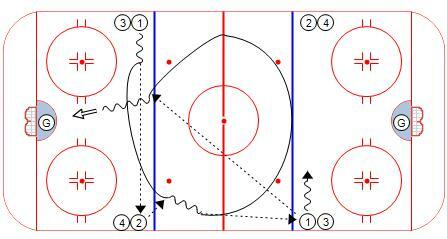 (1) makes a pass to (3) and continues full-circle to the opposite blueline. (3) makes a stretch pass to (1) on the opposite blueline for a shot on the (G). 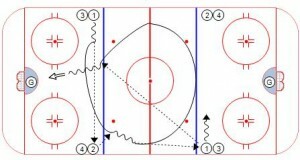 Double Regroup Stretch Pass : see Seq. # 4. On the whistle, (1) skates across the blueline and makes a pass to (2). Return pass to (1). (1) makes a pass to (3) and continues full-circle to the opposite blueline. (1) turns to the boards. (3) makes a stretch pass to (1) for a shot on the (G). On the whistle, (1) skates across the blueline and makes a pass to (2). Return pass to (1). (1) makes a pass to (3) and makes a mohawk turn to the boards. (3) makes a cross-ice pass to (2). 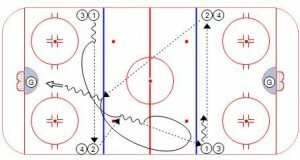 (2) makes a stretch pass to (1) on the opposite blueline for a shot on the (G).